This beautiful bird is merely a winter visitor of the United States, where it is seldom seen before the month of November, and whence it retires as early as the beginning of February. It wanders at times along the sea coast, as far as Georgia. I have occasionally seen it in the lower parts of Kentucky, and in the State of Ohio. It is more frequently met with in Pennsylvania and the Jerseys; but in Massachusetts and Maine it is far more abundant than in any other parts of the Union. The Snowy Owl hunts during the day, as well as in the dusk. Its flight is firm and protracted, although smooth and noiseless. It passes swiftly over its hunting ground, seizes its prey by instantaneously falling on it, and generally devours it on the spot. When the objects of its pursuit are on wing, such as ducks, grouse, or pigeons, it gains upon them by urging its speed, and strikes them somewhat in the manner of the Peregrine Falcon. It is fond of the neighbourhood of rivers and small streams, having in their course cataracts or shallow rapids, on the borders of which it seizes on fishes, in the manner of our wild cat. It also watches the traps set for musk-rats, and devours the animals caught in them. Its usual food, while it remains with us, consists of hares, squirrels, rats, and fishes, portions of all of which I have found in its stomach. In several fine specimens which I examined immediately after being killed, I found the stomach to be extremely thin, soft, and capable of great extension. In one of them I found the whole of a large house-rat, in pieces of considerable size, the head and the tail almost entire. This bird was very fat, and its intestines, which were thin, and so small as not to exceed a fourth of an inch in diameter, measured 4 1/2 feet in length. When skinned, the body of the Snowy Owl appears at first sight compact and very muscular, for the breast is large, as are the thighs and legs, these parts being covered with much flesh of a fine and delicate appearance, very much resembling that of a chicken, and not disagreeable eating, but the thorax is very narrow for so large a bird. The keel of the breast-bone is fully an inch deep at its junction with the fourchette, which is wide. The heart and liver are large; the oesophagus is extremely wide, enabling the bird to swallow very large portions of its food at once. The skin may be drawn over the head without any difficulty, and from the body with ease. The male weighs 4 lbs., the female 4 3/4 lbs., avoirdupois. The observations which I have made induce me to believe that the pure and rich light yellowish whiteness of this species belongs to both sexes after a certain age. I have shot specimens which were, as I thought, so young as to be nearly of a uniform light-brown tint, and which puzzled me for several years, as I had at first conceived them to be of a different species. This, indeed, led me to think that, when young, these birds are brown. Others were more or less marked with broad transverse lines of deep brown or black; but I have seen specimens of both sexes perfectly free from spots, excepting on the occiput, where I have never missed them. Scarcely is there a winter which does not bring several of these hardy natives of the north to the Falls of the Ohio at Louisville. At the break of day, one morning, when I lay hidden in a pile of drift logs, at that place, waiting for a shot at some wild geese, I had an opportunity of seeing this Owl secure fish in the following manner:--While watching for their prey on the borders of the "pots," they invariably lay flat on the rock, with the body placed lengthwise along the border of the hole, the head also laid down, but turned towards the water. One might have supposed the bird sound asleep, as it would remain in the same position until a good opportunity of securing a fish occurred, which I believe was never missed; for, as the latter unwittingly rose to the surface, near the edge, that instant the Owl thrust out the foot next the water, and, with the quickness of lightning, seized it, and drew it out. The Owl then removed to the distance of a few yards, devoured his prey, and returned to the same hole; or, if it had not perceived any more fish, flew only a few yards over the many pots there, marked one, and alighted at a little distance from it. It then squatted, moved slowly towards the edge, and lay as before watching for an opportunity. Whenever a fish of any size was hooked, as I may say, the Owl struck the other foot also into it, and flew off with it to a considerable distance. In two instances of this kind, I saw the bird carry its prey across the Western or Indiana Shute, into the woods, as if to be quite out of harm's way. I never heard it utter a single note on such occasions, even when two birds joined in the repast, which was frequently the case. when the fish that had been caught was of a large size. At sunrise, or shortly after, the Owls flew to the woods, and I did not see them until the next morning, when, after witnessing the same feats, I watched an opportunity, and killed both at one shot. An old hunter, now residing in Maine, told me that one winter he lost so many musk-rats by the Owls, that he resolved to destroy them. To effect this, without loss of ammunition, a great object to him, he placed musk-rats caught in the traps usually employed for the purpose, in a prominent spot, and in the centre of a larger trap. He said he seldom failed, and in this manner considerably "thinned the thieves," before the season was over. He found, however, more of the Great Grey Owl, Strix cinerea, than of the Snowy Owl. The latter he thought was much more cunning than the former. In the course of a winter spent at Boston, I had some superb specimens of the Snowy Owl brought to me, one of which, a male, was alive, having only been touched in the wing. He stood upright, keeping his feathers close, but would not suffer me to approach him. His fine eyes watched every movement I made, and if I attempted to walk round him, the instant his head had turned as far as he could still see me, he would open his wings, and with large hops get to a corner of the room, when he would turn towards me, and again watch my approach. This bird had been procured on one of the sea-islands off Boston, by a gunner in my employ, who, after following it from one rock to another, with difficulty wounded it. In the course of the same winter, I saw one sailing high over the bay along with a number of gulls, which appeared to dislike his company, and chased him at a respectful distance, the owl seeming to pay no regard to them. Several individuals have been procured in South Carolina, one on James' Island, another, now in the Charleston Museum, on Clarkson's plantation, and a fine one was shot at Columbia, the seat of government, from the chimney of one of the largest houses in that town, and was beautifully preserved by Professor Gibbes of the Columbia College. I once met with one while walking with a friend near Louisville in Kentucky, in the middle of the day. It was perched on a broken stump of a tree in the centre of a large field; and, on seeing us, flew off, sailed round the field, and alighted again on the same spot. It evinced much impatience and apprehension, opening its wings several times as if intending to fly off; but, with some care, it was approached and shot. It proved to be a fine old female, the plumage of which was almost pure white. I have heard of individuals having been seen as far down the Mississippi as the town of Memphis. 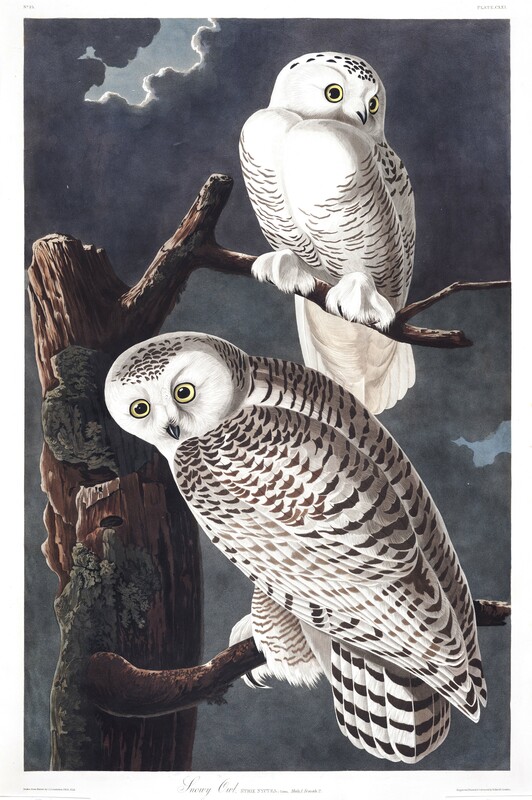 Some Indians assured me that they had shot one at the mouth of the Red River; and, while on the Arkansas River, I was frequently told of a large White Owl that had been seen there during winter. So much has been said to me of its breeding in the northern parts of the State of Maine, that this may possibly be correct. In Nova Scotia they are abundant at the approach of winter; and Professor MACCULLOCH, of the University of Pictou, shewed me several beautiful specimens in his fine collection of North American birds. Of its place and mode of breeding I know nothing; for, although every person to whom I spoke of this bird while in Labrador knew it, my party saw none there; and in Newfoundland we were equally unsuccessful in our search. STRIX NYCTEA, Linn. Syst. Nat., vol. i. p. 132. Lath., Index Ornith., vol. i. p. 57. Ch. Bonaparte, Synops. of Birds of the United States, p. 36. Swains. and Richards. Fauna Bor. Americ., vol. i. P. 88. SNOWY OWL, Strix nyctea, Wils. Amer. Orn., vol. iv. p. 53, pl. xxxii. fig. 1. Nutt. Man., vol. i. p. 116. Tail rather long, moderately rounded; plumage white; head and back spotted; wings, tail, and lower parts barred with dusky brown. Young pure white. Individuals vary much in markings. Male, 21, 53. Female, 26, 65.